The building that Dröm Sött, Sweet Dreams Inn calls home has a century old and diverse history. Originally built around 1920 by C.A. Lundstrom, the 2 story building was designed with a stucco exterior reflecting the Mission style. It housed the Lindsborg Seed & Implement store until Mr. Lundstrom converted it into a Studebaker car and Banner buggy dealership. Years later, Mr. Lundstrom transformed the building into the town’s first luxury hotel named Hotel Carlton, opening in July of 1930 with a construction cost of $50,000. On the first floor of this luxury hotel there was a coffee shop, a barber shop and Dr. W.W. Peterson’s dental office. In addition, there was a shoe shining parlor managed by Harold Patrick, a local high school student. It also boasted a recreation room which at the time was rather controversial . . . it contained pool tables! Some religious people in town were dubious about the advisability of a pool hall, but Mr. Lundstrom kept control of it by asking a membership fee of $1.00 from each user. Later, the suitability of the pool hall was reviewed and a city vote was held. By a large margin it was decided to allow everyone over a certain age to use the recreation room. In the early years and still today, Easter week is the busiest time of the year for Lindsborg. The Hotel Carlton hosted many of the soloists for the Messiah Festival at Bethany College, as well as audience members. This time was always very special in the life of Lindsborg and the Carlton Hotel. A local historian recalls a soprano soloist who walked into the recreation room and astounded everyone by not only playing pool, but winning every game she played! She was the envy of the whole town. Later the Hotel Carlton passed on to the ownership to Mr. and Mrs. Harry Carbiener, who then subsequently sold to Bethany College, which used it for many years as the men’s off-campus housing. The building was then purchased in 1986 by Mr. and Mrs. Quintin Applequist and was completely restored and named the Swedish Country Inn. In May of 1995, ownership passed to Becky Anderson of Lindsborg. For 32 years the Swedish Country Inn accommodated guests of the Messiah Festival as well as many tourists who come to see the charming community of Lindsborg, Kansas. Today the grand old building is once again reinventing itself to better contribute to the tradition and vitality of Lindsborg. New owners, Mark and Marty Schupbach purchased the Swedish Country Inn in the summer of 2018 and closed for a few months to completely renovate and modernize. This was not just a coat of paint but a top to bottom restoration. From new air conditioning and heating units, to new plumbing, 100% new bathrooms, new mattresses and the list goes on. It is Mark and Marty’s desire to continue the inn’s story of warm and welcoming hospitality and to blend the best elements of the past with fresh updated finishes and technology. The name, Dröm Sött Inn was carefully and thoughtfully chosen. 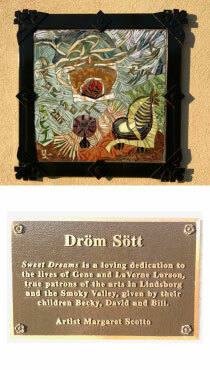 Dröm Sött is “sweet dreams” in Swedish which honors the rich heritage of Lindsborg. Also, on the inn’s front exterior there is a piece of mosaic art (pictured below) that was gifted to the inn. What a perfect way to honor the Swedish heritage, the history of those who have loved this special town and to hold true to our wishes for every guest. Dröm Sött Inn promises a break from the mundane routine of daily life and offers an opportunity to rest, restore and refuel. We hope that your days are filled with adventure as you explore our little town of Lindsborg and your nights at the Dröm Sött Inn are filled with sweet dreams. The entire Dröm Sött team is excited to welcome you to our precious new inn and we are confident you will delight in your stay with us.